The year 2018 sees major anniversaries: 75 years since the Warsaw Ghetto Uprising, seventy years since the founding of the State of Israel. March this year has seen a series of events commemorating another 75th anniversary, of the rescue of the Bulgarian Jews from the Holocaust. As World Jewish Congress president Ronald S Lauder put it: “Bulgaria has set an example for the world to follow. And you remind us all today to never be silent in the face of evil. To always have the courage to stand up for what is right. And to follow the simple rule that we all learned so long ago: to treat others as we would like them to treat us”. 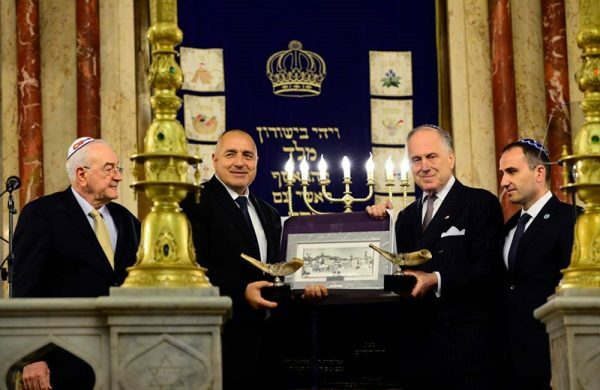 Such was the significance accorded to the March 2018 commemorations in Bulgaria that Lauder came in person on March 10 to the ceremony in Sofia Central Synagogue, where the Bulgarian government and Sofia municipality were honoured for their fight against anti-Semitism, a ceremony that also saw the launch of the book Bulgarian Jews: Living History, published by the Organization of the Jews in Bulgaria “Shalom”. “Everywhere you turn in Europe, you are standing on a killing ground of such terrible loss and sadness. Not here in Sofia. What happened here is unique in the history of World War, and frankly, it is unique in all of mankind,” Lauder told the ceremony at the Synagogue. During his visit, Lauder was accompanied by WJC chief executive Robert Singer, while a series of the events commemorating the anniversary of the rescue of the Bulgarian Jews and the deportation to their deaths of 11 343 Jews from the “new lands” that in 1943 were under Bulgarian administration was attended also by Ernest Herzog, head of the WJC representative office for the Balkan countries. This included the historic visit, the first of its kind, by Bulgarian Prime Minister Boiko Borissov to Skopje for official commemorations of the deportation of the more than 7000 Jews from the territory of today’s Republic of Macedonia. 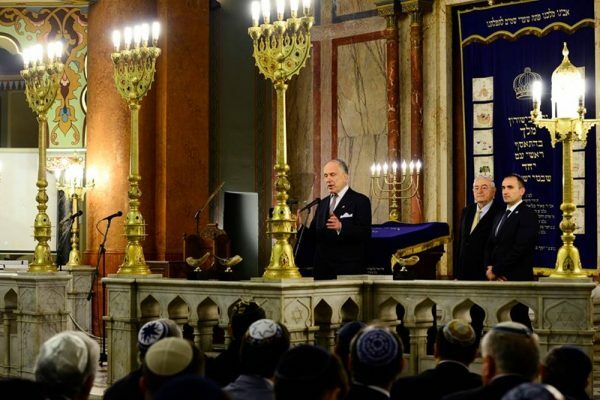 Lauder referred to these latter events in his March 10 speech at the Synagogue: “This anniversary, 75 years after the Jews of Bulgaria were saved, is not a completely happy story. There were 11 300 Jews living in Bulgarian-administered territories in northern Greece, Eastern Serbia, and Macedonia who were deported by the Nazis and their allies and murdered in Treblinka’s gas chambers. But we are grateful for those (the Bulgarian Jews) who were saved”. The list of events around the March 2018 anniversary has been a considerable one. An important element, too, was the fact that throughout, representatives of the leadership and membership of the Ehud Oley organisation of Bulgarian Jews in Israel travelled from that country to participate, speaking frequently – and movingly – of their gratitude for the actions of those leaders and ordinary people of Bulgaria who carried out the rescue 75 years ago, and doing so in the Bulgarian that remains their mother tongue. 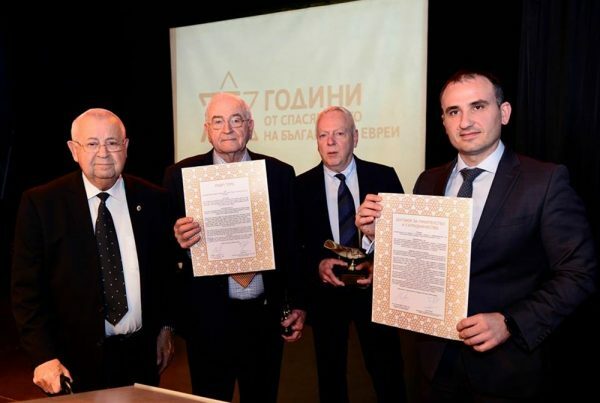 The events included a March 7 concert of works by Bulgarian composers of Jewish origin, an occasion that also saw Shalom confer honours on the Union of Bulgarian Doctors for the courageous moral stand taken by their predecessors 75 years ago. Rabbis from Balkan countries were part of the succession of events too, taking part in discussions with the Bulgarian Jews from Israel and participating in a celebratory meal with Sephardic cuisine on March 8, a nod to the fact that the majority of Bulgarian Jews are of Sephardic origin, a result of the history of the expulsion of Jews from the Iberian peninsula following the Decree of Alhambra, and their acceptance in the territory of the Ottoman Empire of the time. That day also saw a meeting of a large delegation including leaderships of Bulgarian Jewish organisations from Bulgaria and Israel with Bulgarian Orthodox Church Patriarch Neofit and senior clergy, in honour of the leading role played by the church in the 1943 rescue of the Bulgarian Jews. Foreign Minister Ekaterina Zaharieva held talks with the delegation from Israel, which included members of the Knesset, underlining that relations between Bulgaria and Israel were very good and expressing hopes that economic contacts would intensify. March 9, the day for solemn ceremonies of commemoration, saw floral tributes laid by government and municipal representatives, diplomats and community organisations at the Monument of Gratitude in Sofia. The same day saw an event at the National Assembly in which Shalom conferred honours in memory of the deeds of heroes of the rescue such as Dimitar Peshev, who in 1943 was Deputy Speaker, and other MPs from the ruling majority who opposed the deportation of the Bulgarian Jews. At the same event, the book “75 Years. Unforgotten Faces of the Rescue,” which tells the stories of ordinary Bulgarians who opposed the deportations and anti-Semitism, was presented. The focus moved the Synagogue that Friday evening, as rabbis from the Balkan countries and serving in Bulgaria led a Shabbat service, which was followed by a formal Shabbat dinner at Shalom’s headquarters. As noted, the evening of March 10 again saw a large turnout at the Synagogue for the commemorative events. On March 11, with representatives of the World Jewish Congress and the American Jewish Joint Distribution Committee, among many others, in attendance, commemorations were held in Plovdiv and at Bachkovo Monastery. Speaking at a wreath-laying at the Monument of Gratitude in Plovdiv, Israeli ambassador Irit Lilian said the State of Israel is eternally grateful to the Bulgarian people and clergy who in those times rescued thousands of Jews, adding also commemoration for the Jews from territories in northern Greece and Yugoslavia, then under Bulgarian administration, who were deported to be murdered in Treblinka. Today, the language of hatred, xenophobia and anti-Semitism was not a thing of the past, she said. “That is why we have to unite. We must not forget that the rescuers of the Jews were people who made and followed through their choice. We should not forget that indifference is not the beginning, it is the end, as Elie Wiesel said. Bulgarians will always be remembered for not surrendering their humanity. That is why Israel will always be grateful”. 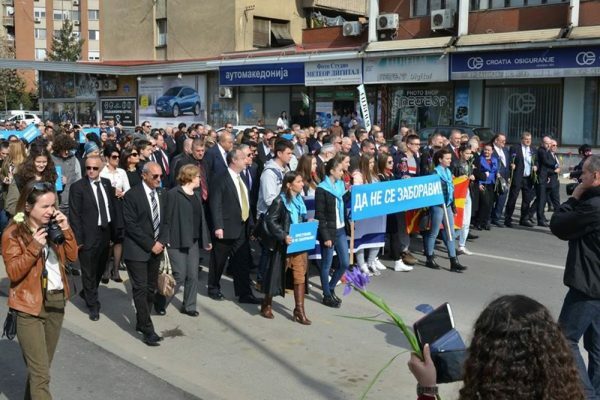 In Skopje on March 12, the historic occasion at which Borissov and Macedonia’s Prime Minister Zoran Zaev stood together to mourn for the Jews deported from those territories to the Holocaust, those in attendance included the leadership of Shalom, of the Central Israelite Religious Council of Bulgaria, the representative in Bulgaria of the American Jewish Committee, US ambassador to Bulgaria Eric Rubin US Special Envoy for Holocaust Issues Tom Yazdgerdi, US ambassador to Macedonia Jess Baily, Paul Shapiro and Radu Ioanid of the US Holocaust Museum and the leadership of the Association of the Jewish Community in Macedonia as well as Ernest Herzog of the WJC. 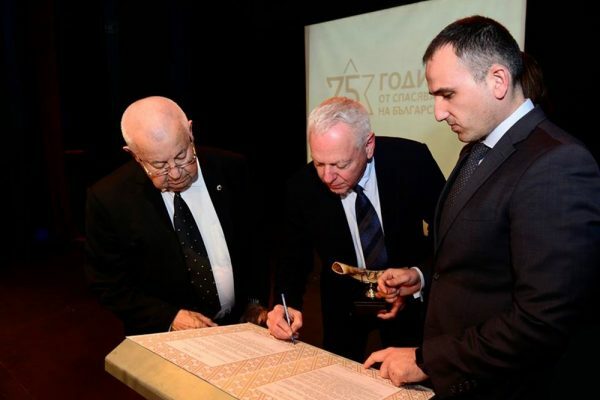 Zaev told the ceremony: “Our unity in condemning and remembrance of the deportation of our fellow citizens to the Treblinka death camp is more than just symbolic. Today we are repeating the lessons from the past, in order to further illuminate the roadmap for the future that we have jointly chosen. Hatred is not our choice. Acceptance of diversity, love for one’s neighbour, but also respect for the other, support, co-operation and friendship are the values ​​that we accept with our thoughts and hearts, and we keep them with our deeds”. 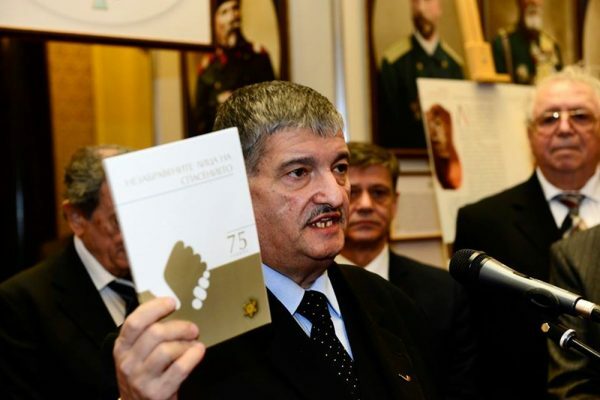 The commemorative events of the 75th anniversary in 2018 continue with an academic conference in Sofia on March 14, and later in the year, events elsewhere in Bulgaria, including in Dupnitsa, Lom, Rousse, Bourgas, Kurdzhali, Pleven and Varna, in addition to events scheduled in Sofia.